Government District Homoeopathy Hospital Thrissur attains a big milestone in infertility treatment. The department of homoeopathy celebrated this on achieving 25 successful cases of birth .The familes of the babies born with the help of homeopathic infertility treatment gathered here today in a function "Sayoojyam". The event was inaugurated by the District Panchayath president Smt.Mary Thomas.The District Medical Officer Dr Valasalan presided the meeting. The chief guest of the function was Adv. Chandrashekaran Narayanan. The Homoeopathic infertility clinic is under the seethlayam project which is run at the govt. homooepathic hospital Thrissur. All the government hospitals in the state of Kerala are going on with success stories. 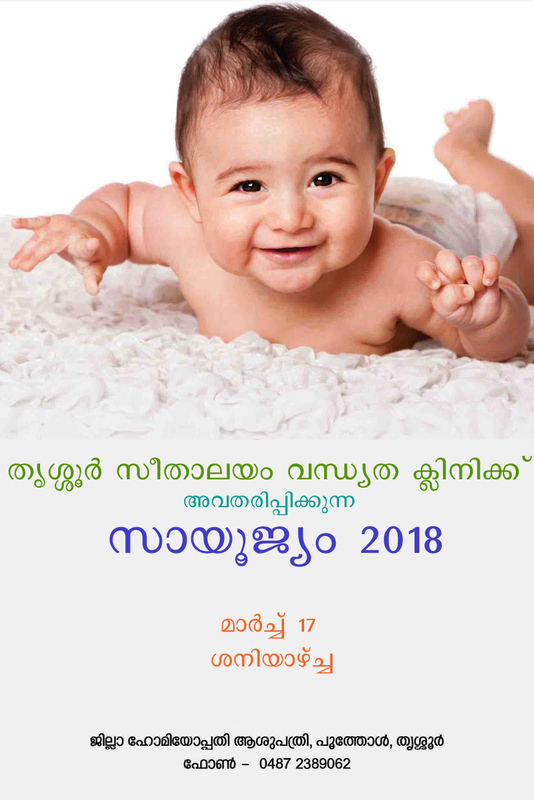 The OP at Thrissur is run with prior booking on 2 days a week and is free of cost.Dr Lathika ,Dr Jaya, Dr Parvathy, Dr Sujatha, Dr Nithin Paul along with the staff of the hospital gathered here with the happy families and their babies. The parents were very happy and were thankful to the doctors and homoeopathy which helped them in accomplishing their dreams. Many of the infertility cases that came to the Homoeopathic hospitals were treated in various infertility centers of other systems with little success. They even had a lot of money spent on their treatments. Its not the first time that its being done by homoeopaths and Homoeopathy. It has been in the news about Govt homoepathic hospital in Kannur with the same results.